Annual list points to continued expansion by senior living companies of all sizes. 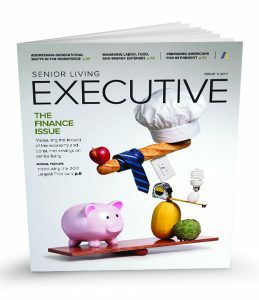 The senior living industry has continued to evolve and expand since Senior Living Executive began publishing the annual largest providers list two decades ago. In that time, companies have been bought and sold, consolidated, reorganized, rebranded, expanded, contracted, and folded altogether. This year’s largest provider, Brookdale, became, by far, the largest player in the industry when it merged with Emeritus in 2014. Today, Brookdale reports nearly 100,000 senior living units in its buildings, more than double the units of its nearest competitor, Holiday Retirement, which largely serves independent living residents. 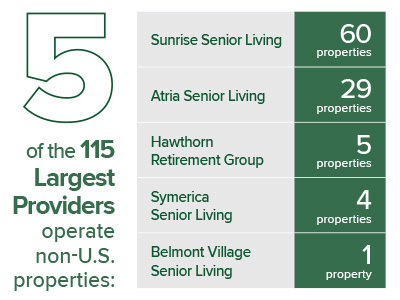 The next five senior living providers are fairly similar in size—from nearly 20,000 to 27,000 units. 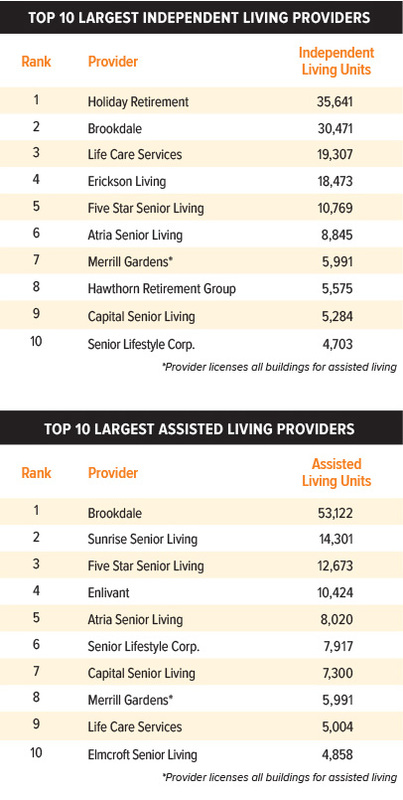 Overall, the 2017 list of the 115 largest senior living providers represents nearly 550,000 senior living units, including assisted living, independent living, and memory care. From the No. 1 provider to the No. 115 provider, seniors are served by a wide variety of senior living models. Occupancy has remained fairly stable for senior living, now a mature industry, for some time. The occupancy rate for senior housing for the nation’s largest 31 metropolitan areas was 88.8 percent in the second quarter of 2017, down 50 basis points* from the first quarter, according to the National Investment Center for Seniors Housing & Care (NIC) MAP Data Service. “This placed occupancy 190 basis points above its cyclical low of 86.9 percent during the first quarter of 2010 and 140 basis points below its most recent high of 90.2 percent in the fourth quarter of 2014,” explains Beth Burnham Mace, chief economist at NIC. The quarterly decrease in occupancy correlates with providers’ aggressive pursuit of new building projects, so “inventory outpaced a change in net absorption,” Mace says. “The increase in inventory was the most in a single quarter since NIC began reporting the data in 2006. It’s notable that inventory growth has been ramping up for a much longer period for assisted living than for independent living, and as of the second quarter, annual inventory growth for assisted living reached its highest level since 2006—5.9 percent.” While demand was strong, it wasn’t quite “strong enough” to increase occupancy levels, according to Mace. Still, at 4.3 percent, the annualized pace of absorption was the highest rate since NIC began reporting the data, she says. While exact comparisons to 2016 aren’t feasible due to changes in ranking criteria, the top 10 largest providers remain unchanged with the exception of Five Star Senior Living moving to the No. 3 spot and Enlivant eclipsing Affinity Living for No. 10. Five Star reported 14 acquisitions and expansions in the 12 months prior to March 31, while Enlivant grew by 3,000 units. Erickson Living (No. 6) is investing $1 billion for 4,000 additional units this year. Pacifica Senior Living (No. 15) acquired 12 buildings totaling 1,100-plus units in the past year. American House Senior Living Communities (No. 19) has five residences under development or construction. Senior Resource Group (No. 20, up from No. 26 in 2016) acquired 14 communities late last year and has more in the works. Spectrum Retirement Communities (No. 26, up from No. 34 in 2016) has 13 properties under construction that will add another 2,000-plus units. Pathway to Living (No. 38, up from No. 56 in 2016) will open four residences this year. Within the past 12 months, Koelsch Communities (No. 56) has had six properties under development. Ridgeline Management Company (No. 68) recently acquired two communities in Utah, expanded a campus in Texas, is building a new community in Oregon, acquired a hotel conversion in Arizona, and has several other projects in the works. The list of companies experiencing significant growth is substantial. Perhaps one of the most obvious indicators of the continued expansion of the senior living business is found among the smallest providers in the 2017 largest providers list. The company in the No. 100 spot this year, Schonberg Care, shows 973 units. Last year’s No. 100, SAL Management Group, reported a resident capacity of 434. SAL has now grown from 10 to 15 communities and 693 units and sits at No. 110, thanks to the addition of a number of providers to this year’s list, including Maplewood (No. 97), Symerica (No. 107), IntegraCare (No. 108), and others. The smallest provider, at No. 115, is New Forum with 426 units and three communities. The continuing care retirement community (CCRC) concept has re-emerged this year. Senior Living Executive tracked CCRCs for the first time in the 2017 survey. Sixteen of the 115 largest providers operate CCRC communities, including Erickson Living, which reported more than 20,000 CCRC units; Life Care Services and Brookdale, which each reported more than 19,000; and Five Star, which reported more than 9,000 CCRC units. For residents, continuing care retirement communities can be an attractive option. Seniors can be assured care, regardless of their needs, including skilled nursing care. Another newly tracked data point in the 2017 list is providers’ participation in Medicaid waiver programs, which can provide much-needed financial assistance for low-income seniors seeking assisted living or memory care. About 40 percent of the largest 115 providers currently participate in state Medicaid waiver programs, with several states represented. Eligibility and coverage varies by state. Senior living isn’t just a health care and hospitality business; it’s also an attractive investment. Senior living real estate investment trusts (REITs) report a combined investment value of $52 billion in more than 2,400 properties. While some providers continue to both own and operate their properties, an increasing number have sold the real estate to investment trusts. Consider that Ventas reported $8.6 billion in senior housing investment value in 2015 compared with $16 billion today, and Senior Housing Properties Trust reported $3.3 billion in 2015 versus $4.5 billion today. Private equity firms have also plowed funds into properties with the anticipation of solid returns. For example, Capitol Seniors Housing has $1 billion in equity in 24 senior living properties. Others, including Carlyle Group (HCR Manorcare), Blackstone (Senior Lifestyles), and TPG (Enlivant), for example, have equity in any number of properties in the largest providers list. It seems clear, as private equity funds and REIT investments continue to pour into the business, senior living properties will continue to change hands, fueling both acquisitions and new developments. Despite optimism about senior living overall, providers acknowledge that coming years will bring their own set of challenges. The percentage of the population that is aged 65 and over is expected to grow from 15 percent to 24 percent by 2060, according to the U.S. Census Bureau. Not only will this demographic shift impact the number of seniors needing care, but it points to a shrinking market for employees. Finding qualified staff will continue to be an issue as senior living providers represent a significant employer base, with some providers reporting nearly a one-to-one employee to resident ratio. Access a detailed report of the 2017 Argentum Largest Providers list, featuring 115 providers and nearly 550,000 units across the country.